Call us today 218-831-2284 for more information on the main game of internet marketing: SEO! At BAMsites Web Marketing, we believe SEO (search engine optimization) is the biggest single factor to website success. We employ both internal and external methods to drive targeted ready-to-buy traffic to you. 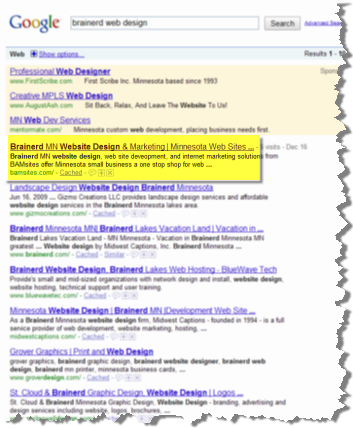 BAMsites is highly regarded as a premier regional SEO service in north central Minnesota and beyond. Our goal is to achieve free organic traffic, obviating the need for paid advertising. We practice proven techniques geared for organic or natural rankings on Google and other search engines such as Yahoo and MSN or BING. If you employ BAMsites, you will be rewarded with targeted traffic and qualified buyers. If you don’t employ a well designed SEO strategy, your website will flounder and be largely ineffective. We have 15 years of intense SEO experience (far more than any other service in the region) and can put you where you need to be, often lessening or eliminating the need for other external advertising. We can perform SEO on a website regardless of whether or not we built the site, so long as we get access to the website files.